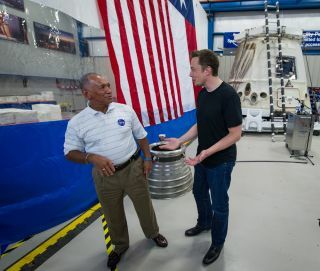 NASA Administrator Charles Bolden, left, and SpaceX CEO and chief designer Elon Musk view the company's Dragon capsule, right, in June 2012. This capsule made history several weeks earlier, becoming the first private spacecraft ever to carry supplies to the International Space Station. Billionaire entrepreneur Elon Musk, founder of the private spaceflight company SpaceX, teams up with NASA chief Charles Bolden in a Google+ "hangout" today to discuss this weekend's planned launch of SpaceX's first official cargo delivery to the International Space Station. Musk's SpaceX is poised to launch a Falcon 9 rocket topped with an unmanned Dragon space capsule on Sunday night (Oct. 7) on a three-day trip to deliver a half-ton of supplies to the space station. Liftoff is set for 8:35 p.m. EDT (0035 Monday GMT), with docking at the station set for Oct. 10. Elon Musk, who founded SpaceX in 2002, and Bolden "will talk about the flight, which will be the first of 12 contracted for NASA by SpaceX to resupply the space station," NASA officials said. The mission is the first for NASA's Commercial Resupply Services program. While the May test flight did carry some cargo to and from the space station for NASA, this weekend's mission — called the SpaceX CRS-1 flight — is the first official cargo run for SpaceX. The Dragon spacecraft is packed with 1,000 pounds (453 kilograms) of supplies for the space station's three-person crew, including gear for 166 different experiments. SpaceX is one of two private spaceflight firms contracted by NASA to provide cargo delivery serves to the space station. The other company, the Virginia-based Orbital Sciences Corp., has a $1.9 billion deal to use its new Antares rocket and Cygnus spacecraft to fly at least eight cargo missions for NASA. With NASA's space shuttle fleet retired, the space agency is depending on private space taxi, like those planned by SpaceX, Orbital Sciences and others, to ferry U.S. cargo — and eventually astronauts — into and from low-Earth orbit. SpaceX's Dragon spacecraft are the first American spacecraft to make unmanned resupply flights to the space station. However, robotic spacecraft from space agencies in Russia, Europe and Japan do make regular trips to stock up the orbiting lab.